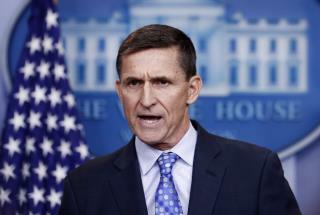 (Newser) – President Trump's former national security adviser provided so much information to the special counsel's Russia investigation that prosecutors say he shouldn't do any prison time, according to a court filing Tuesday that describes Michael Flynn's cooperation as "substantial." The filing by special counsel Robert Mueller provides the first details of Flynn's assistance in the Russia investigation, including that he participated in 19 interviews with prosecutors and cooperated extensively in a separate and undisclosed criminal probe. It was filed two weeks ahead of Flynn's sentencing and just over a year after he became the first of five Trump associates to accept responsibility by pleading guilty to lying to the FBI about conversations with the Russian ambassador. Though the AP reports prosecutors withheld specific details of Flynn's cooperation because of ongoing investigations, their filing nonetheless underscores the breadth of information Mueller has obtained from people close to Trump. It's unclear if Trump will now turn his fury on Flynn, whom Trump grew close to during the 2016 campaign and who has drawn the president's sympathy since he came under investigation. Federal sentencing guidelines recommend between zero and six months in prison for Flynn, leaving open the possibility of probation. Mueller's office said Flynn's cooperation merits a sentence at the bottom end of that range. The AP has much more here, including how Flynn's case has stood apart from those of other Trump associates. This has to be driving the ones crying treason for 2 year. Whats the big fish, they guy getting 14 days vs the 6 months Mueller wanted. Another "big Fish' getting no time?